Just because winter is coming it doesn't mean that you should overlay your body with unflattering winter clothes. True style is preparing for winter dressed in the best way possible. Now ladies, we all know that wearing a puffed jacket or heavy trench-coat can sometimes look unflattering but winter ponchos can come in very handy. Always get yourself a long-lengthed poncho, especially if you decide to wear the poncho with a dress. It also helps to avoid the cold Winter breeze in the morning and evening. We've also heard from many fashion gurus that a poncho worn with flat shoes screams DISASTER. So, always make sure you step out in your best in heels or high-knee boots. According to essentials.co.za it is also advisable that if you plan on wearing a poncho with leggings make sure the leggings are the same color as your shoes. The other cool thing about ponchos is that you can wear them on a laid-back Winter weekend with a pair of sneakers, some joggers and a sweater under, just make sure the colors co-ordinate. 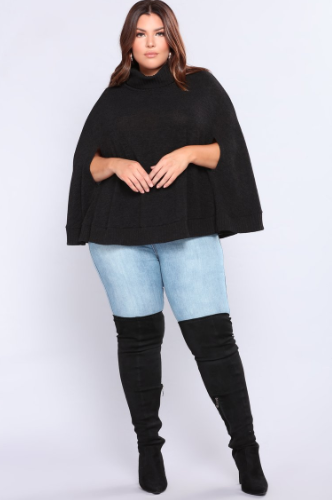 If you're afraid that a poncho will hide your amazing figure, no worries, you can always wear a belt to ensure that the outfit not only enhances your figure but it also creates the illusion that you're not drowning in the poncho. So we hope we've helped you in sorting out your Winter Poncho style essentials. You can purchase your poncho at any South African clothing retail stores but stores like Woolworths, Edgars, Foschini tend to have a variety of poncho's that you can even buy for Summer.